SIAK - The presence of Public Street Lighting - Solar Light (PJU-TS) has slowly reduced the fear of the Siak community, who go to work at night. Before there was a PJU-TS, along the road the Siak people walked from home to factory it was very dark and caused anxiety. Most of the Siak people work in factories or industries which often require that they start working at night. "Before there was Public Street Lighting (PJU) assistance from the government, we made from the community fund to make 10 points PJUs and 20 points PJUs from village funds. It used to be a very dark road to go to work, but now thank God there is PJU," revealed the thanksgiving of the Head of Pinang Sebatang Village, Bambang Saputra, his village is one of the installation points for Public Street Lighting - Solar Light (PJU-TS). 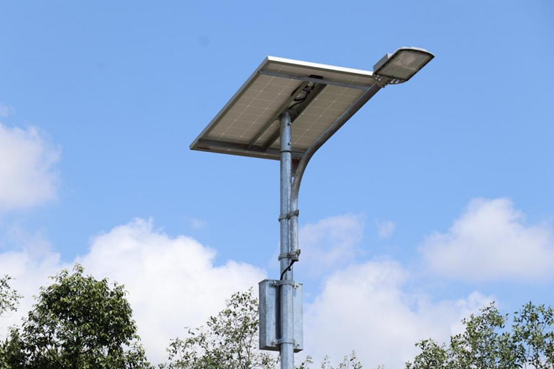 After this installation, Bambang appealed to the public to take care of these assets and hoped that the hamlets that had not received electricity at all, could also be immediately built Public Street Lighting - Solar Light (PJU-TS). "We hold patrols to be monitored and secured," he added. Not only provide security for the Siak community, the Public Street Lighting - Solar Light (PJU-TS) also provides an opportunity for Ngatiah to earn income. Ngatiah is one of the residents of Siak who relies on her daily income from trading food. Although he was reluctant to reveal the range of his income, Ngatiah showed a happiness because she could now work until evening. "Alhamdulillah, I am very happy, now the road near our place is full of the light at night, so there is no need to carry a flashlight when walk at night. We sell not until late because we were afraid of returning, now we dare because there is a light," Ngatiah explained. 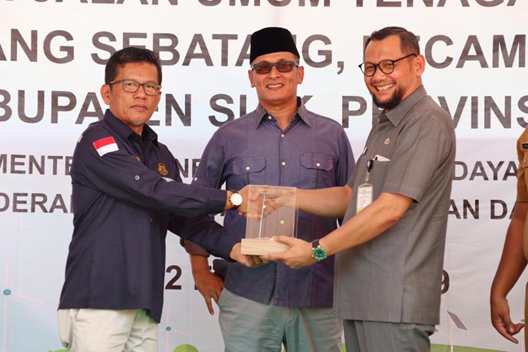 Siak Regency is one of the regencies in Riau Province which has been allocated the installation of Public Street Lighting - Solar Light (PJU-TS), which is 253 points. The total allocation for the installation of Public Street Lighting - Solar Light (PJU-TS) for Riau Province is 1,034 points, of which 550 points including 253 points in Siak Regency are proposals from the local Regency Government initiated by Members of the House of Representatives Commission VII Sayed Abubakar A.Assegaf. In addition to Siak Regency, the installation of Assegaf initiation Public Street Lighting - Solar Light (PJU-TS) is in Meranti 100 point, Pekanbaru 50 points, and Rokan Hulu 253 points.